Earn as much as 2124 points. Earn as much as 577 points. Situated along Canduman in Mandaue City, Eagle's Nest offers apartment-type accommodations fitted with pract... Hop on a plane to Cebu to discover its sights and sounds and let Eagle's Nest provide you with comfort and convenience during your vacation. Offering a spectacular view of the city and the neighboring mountains, Cebu Guest Inn has everything you need for that exciting and memorable stay right in the heart of Cebu City. 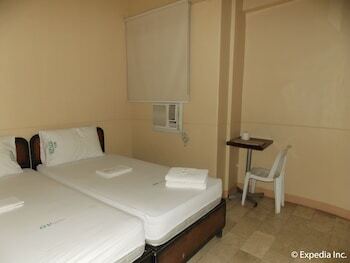 Cebu Guest Inn is ideal for budget travelers and backpackers. Even wi... Offering a spectacular view of the city and the neighboring mountains, Cebu Guest Inn has everything you need for that exciting and memorable stay right in the heart of Cebu City. Cebu Guest Inn is ideal for budget travelers and backpackers. Even with pocket-friendly prices, you can expect excellent amenities and services that will make you feel at home and at ease. The 24-hour front desk makes sure that all your needs and concerns are well-attended. There is a business center available for your office needs and a barbecue for those who wish to prepare their own meals. The free WiFi, on the other hand, lets you stay connected to the Internet. There are 4 rooms available at the Cebu Guest Inn. Each room has a balcony where you can enjoy a view of the neighboring Talisay and Mandaue City. Other amenities include a desk, an in-room safety deposit box, and an en suite bathroom with shower. And if necessary, you can request for extra beds from the hotel's front desk. Cebu Guest Inn is located along the Holy Family Road in Cebu City's Barangay Busay, about 18 kilometers away from the Mactan ? Cebu International Airport. For your convenience, the hotel provides a complimentary one-way airport pickup. For guests who are coming in via private transportation, the hotel has free parking spaces available. Going to Talisay City soon? Consider staying at GV Hotels Talisay City and experience comfort and convenience unlike any other. GV Hotels Talisay City is right along the National Highway in Talisay Citys Barangay Tabunok. The hotel is about 16 kilom... Going to Talisay City soon? Consider staying at GV Hotels Talisay City and experience comfort and convenience unlike any other. GV Hotels Talisay City is right along the National Highway in Talisay Citys Barangay Tabunok. The hotel is about 16 kilometers away from the Mactan ? Cebu International Airport and is accessible to all kinds of public transportation. If you're bringing your own vehicle, there are free parking spaces that you can use when you get there. GV Hotels are known for their comfortable accommodations and convenient services at pocket-friendly prices. The Talisay City branch carries the same brand and is perfect for travelers who are on a shoestring budget. Even with its affordability, expect each one of the 49 rooms available at GV Hotels Talisay City to be of superior quality as it is equipped with practical amenities to make your stay as hassle-free as possible. The rooms are fully air conditioned and come with private bathrooms complete with showers and free toiletries. There are TVs with cable channels for in-room entertainment. Earn as much as 946 points.